Nobody goes to “Il Trovatore” for the plot. The Verdi opera’s improbable story line is famously ripe for parody (most notably by the Marx Brothers and by Gilbert & Sullivan), and it presents some formidable staging challenges. 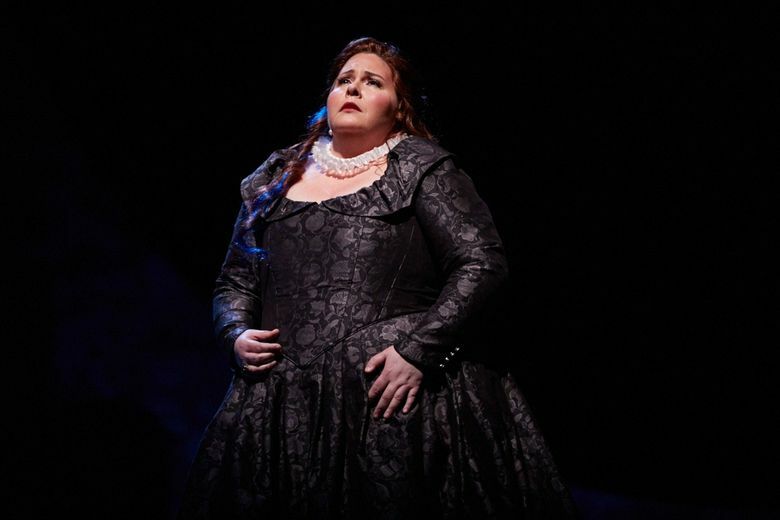 But it also offers one great aria after another, some exciting choruses and some of the meatiest roles in all of opera. 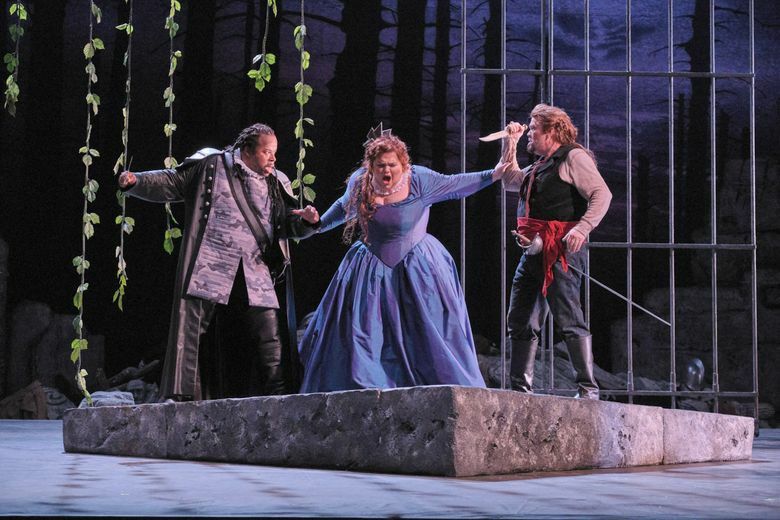 Seattle Opera has risen to these challenges with two terrific casts in a fairly straightforward approach to “Trovatore,” with mostly period sets (originally by John Conklin, reworked by associate designer Christopher Mumaw) and costumes (by Candace Frank), an imaginative newcomer as stage director and a first-rate veteran conductor in the orchestra pit. This being the height of cold/flu season, Seattle Opera’s general director Aidan Lang took to the stage before both shows to announce the mild illnesses of Adam Lau (as Ferrando, in both performances) and tenor Martin Muehle (as Manrico, on Sunday), who both nonetheless went on to give remarkably good efforts; few could have guessed that they were unwell. The four major roles in “Il Trovatore” are arduous and demanding, with familiar arias that provide a real proving ground for singers. On Saturday, the opening-night audience heard the resplendent soprano Leah Crocetto (last heard here in the title role of “Aida“) as Leonora, offering some thrilling high notes and a performance that combined power and easy facility. Her Manrico was Arnold Rawls, a dashing actor whose tenor took a while to warm up but rose to the challenge of “Di quella pira” in fine style. 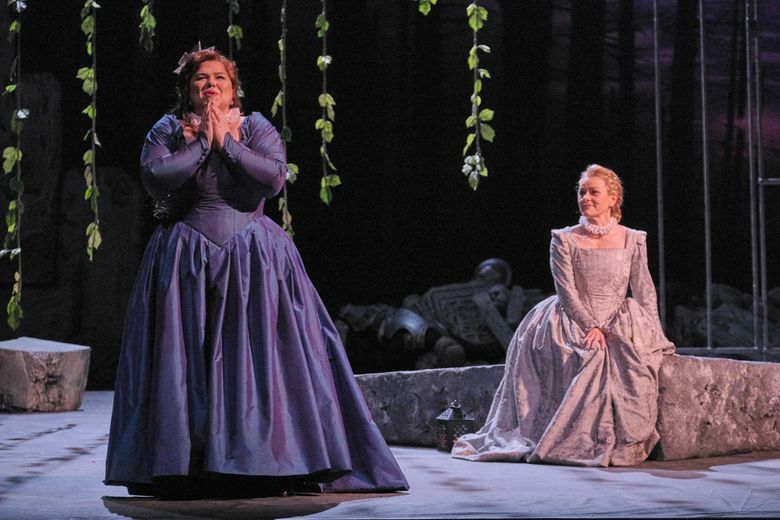 In Sunday’s alternate cast, the standout was the thrilling Leonora of Angela Meade, a soprano from Centralia who has won 57 competition prizes and who debuted at the Metropolitan Opera in 2008. Her beautiful tone quality and her interpretive artistry were capped with an amazing crescendo on the high A-flat at the end of “D’amor sull’ali rosee” — which met with a showstopping ovation of cheers and whistles. Nora Sourouzian’s Azucena grew steadily in strength and finesse as Sunday’s show went on, and baritone Michael Mayes made a vital, vivid di Luna. John Marzano and Nerys Jones were commendable in their supporting roles as Ruiz and Inez. Seattle stage director Dan Wallace Miller made his company mainstage debut with this production, presenting an original, effective approach to an opera that requires a great deal of dashing about — duels, battles, deaths, amorous clinches, treachery, avowals of hatred and love, and renunciations. In one key scene, he reduced a chaotic battle to a slow-motion background for the lovers’ crucial real-time interchange: chancy but effective. Miller also made vivid use of “shadow plays,” backlighted episodes with actors dramatizing the narrative. The chorus, always a vital force in “Il Trovatore,” sang with spirit and accuracy (prepared by chorusmaster John Keene), and Christopher Forey’s lighting was appropriately atmospheric. The single most important element in the production was conductor Carlo Montanaro, whose propulsive sense of drama was equaled only by his lyricism, his ability to “breathe with” the singers and his total command of the score. Lucky singers, instrumentalists … and audiences. Melinda Bargreen is an author and composer who has been a Seattle Times reviewer since 1977. Email: mbargreen@gmail.com. This report is supported, in part, by the Rubin Institute for Music Criticism, San Francisco Conservatory of Music, and the Ann and Gordon Getty Foundation.